If you're one of those user, who like to install Cydia tweaks and its essential packages to improve iPhone, iPad and iPod Touch performance and removing certain restrictions imposed by Apple, then you would be pleased to know that now you can Download .DEB File of Cydia Jailbreak Tweaks Directly on iPhone 5S, iPhone 5C, iPhone 5, iPhone 4S, iPhone 4, iPod Touch 5G, iPad Air 5G, iPad 4G, iPad Mini, iPad Mini 2, iPad 3G and iPad 2G running iOS 7.1.1, iOS 7.1, iOS 7 or older firmwares. As we know, Cydia is a third-party app store with executable files that make tweaks download and install on iPhone, iPad and iPod Touch, and users are not allow to access Cydia Tweaks .DEB Files. So you can follow our below method, guide and Tutorial on How to Download .DEB File of Jailbreak Tweaks from Cydia Directly on iPhone, iPad and iPod Touch running iOS 7.1.1, iOS 7.1, iOS 7 or older firmwares. 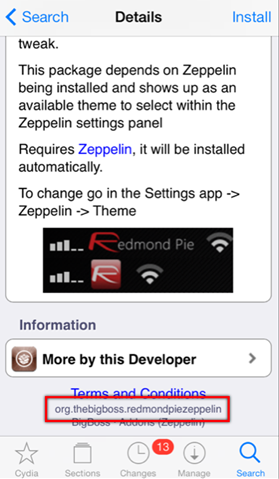 If any Cydia jailbreak tweak installation is dependencies then it will also be downloaded in below tutorial. If any Cydia jailbreak tweak or commercial packages haven't been purchased legitimately via default repositories then below method won't work. 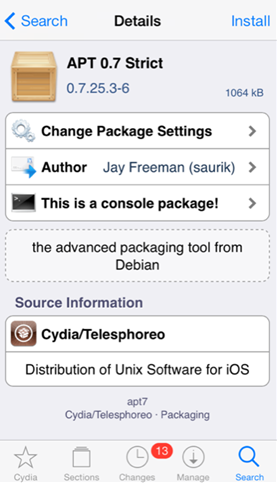 Step 2: Now, Find the Cydia hosted package or tweak of which you want to get .DEB file. At the bottom of the product page, find the unique Bundle ID of the package. It will display like reverse domain name format as: com.developer.thePackageName. Note this unique ID. Step 4: Now, When logged in as root, type in apt-get -d install [Bundle ID]. The [Bundle ID] box will be replaced by unique reverse domain name ID that was recorded in Step 2. If the on-screen information displays then read and accept it by pressing 'Y'.